The open application programming interface (API) of the Parkkihubi data repository, originally constructed for the administration of parking fees, makes Helsinki’s anonymised parking data available to all. 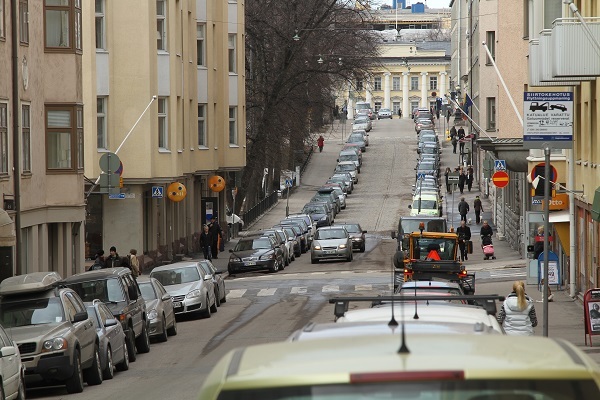 Drivers looking for available parking spaces cause up to a fourth of all the traffic in the Helsinki city centre. The “You have arrived” on the car navigator is not great delight, if there are no parking spaces available. It is now easier than before to find a parking space, thanks to open data. Photo: Seppo Laakso. The navigator could already now tell the driver where parking spaces have recently been vacated. This is made possible by the Parkkihub open API, opened in September 2018. 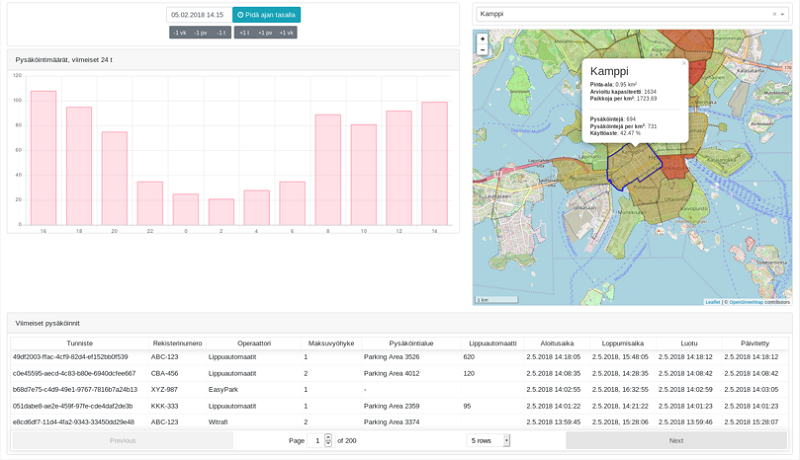 From the new REST API, the parking applications can now ask for real-time data of the parking situation in the circa 1,800 parking areas of southern Helsinki. The new kinds of services are enabled by a digital revolution in parking. The parking control has gone from pen and paper to entirely electronic tools and the parking payments are following suit. TThe popularity of coin payment has decreased drastically during the last few years. Now the aim is to get rid of requirement to put the paper parking receipts on the car´s windshield. “Three out of four parkings are already paid for with a mobile app”, says Parkkihubi Project Manager Lauri Uski at the City of Helsinki Urban Environment Division. When mobile user finishes their parking, the information of the vacant parking space is transmitted to Parkkihubi, and through its open interface the information becomes available to any digital service. “Hopefully, in the future, the phone navigator can tell the route, but also where the driver is likely to find a parking space”, envisions Lauri Uski. The development work on Parkkihubi was a giant leap towards a platform-like method on the City of Helsinki’s part. Earlier, the parking operators were invited to tender, whereas now the City’s parking can be sold by any contract partner that passes a technical auditing. The auditing includes, for example, a check that the systems of the parking operators are compatible with Parkkihubi’s API. Through the API, the companies deliver all the parking events to the City’s data repository. The anonymised open data of the data repository can be utilised by anyone. The system is quite unique even internationally. “This kind of platform economy thinking is a rather new phenomenon in the public sector”, notes Lauri Uski. The digitalisation of Helsinki’s parking spaces was a necessary prerequisite for establishing Parkkihubi. 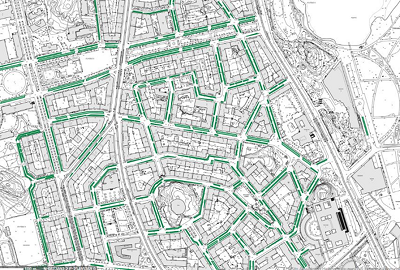 All the 1,800 parking areas in southern Helsinki, as well as all the traffic signs in the area, have been published as open data in HRI but the data is only for test use because it contains some mistakes. Another new thing was the way the data system of Parkkihubi was acquired. The idea was born during the 6Aika pilot project regarding real-time traffic APIs, when the cities were pondering parking issues together. “At that point it appeared to us that a parking hub like this is a smart idea and realisable.” Another lucky break was the blanket agreement that the City of Helsinki made in 2016, which facilitates flexible software development together with the contract suppliers. “We were really making use of it. The whole hub was created with the help of it”, describes Uski. Lauri Uski praises the co-operation with partner company Anders Innovation. There were meetings or Skype meetings at least once a week and being Project Manager was not a great burden to Uski. “Actually, my only task was to say that this is good enough, let’s move on to the next stage”, Uski says with a laugh. The budget of Parkkihubi was not huge either. After all, we are talking about an operative system, which handles 6 million parking events per year and which the entire city’s parking control uses in their work. “The budget was around 70,000 euros, but we did not quite manage to spend all of it”. A centralised data repository has streamlined the operations. Previously, the City received the parking data from the systems of the contract partners, through different kinds of APIs. Now there is only one standard API and the data is centrally controlled by the City. Creating open APIs in existing data systems is often difficult – sometimes even impossible. Parkkihubi was built from scratch and its open API came about effortlessly, as the open API was one of the starting points for the entire project. Uski tells that it was clear from the beginning that the system is built with an open API and that the developers trusted the commercial actors’ ability to make user-friendly services that make it easier, for example, to find a parking space. The open API now offers access to a wide range of open data for creating a situation picture and new services. Now it is the external application developers’ turn to utilise the new API. “But if there are thoughts about what other data is needed, then we will gladly co-operate and think about how the data can be made available”, promises Lauri Uski. The data of Parkkihubi is in practical use in the City’s own operations as well. For example, the City’s traffic planners now get fact-based data of the demand for parking spaces and the duration of parking from different parts of the inner city. The City’s traffic planners utilise the data available through the open API in the planning of the parking. The digitalisation of the parking continues as well. A feature which makes it possible to abandon the parking discs is currently being added to Parkkihubi. The threshold to become a parking operator will also be lowered. According to Uski, entering the field is now hampered by the 300,000 euro security deposit demanded from the operators. If the accounting of parking fees to City would happen, for example, daily instead of the current once a month, then the security deposit could be lowered to a fraction of what it is now. 2015 Helsinki’s, Tampere’s, Turku’s and Oulu’s 6Aika pilot project Liikenteen reaaliaikaiset rajapinnat (LIIRA, “Traffic’s real time APIs”) starts. Helsinki is responsible for the APIs associated with parking data. January 2016 Aim to make Parkkihubi into a centralised data repository with data on parking spaces and the 6 million annual parking events. The development work on the systems starts with flexible means. March 2016 Application developers and constructors of Parkkihubi discuss data wishes and applications enabled by the API at the Helsinki Loves Developers meetup. November 2016 It is decided that Helsinki’s parking services are opened to all service providers that pass the auditing, instead of the previous tendering procedure. January 2017 Parkkihubi into production use, service providers deliver data of each parking event in real time through the API to the system. March 2017 Open parking data is once again the topic at the Helsinki Loves Developers meetup. 2018 Parkkihubi’s data contents opened through the open REST API.